The 36-year-old Italian striker has been at Stamford Bridge for six years, and from the very moment that he blessed the hallowed turf of Stamford Bridge, Franco’s skill, personal appeal and charisma were instantly communicated to the Chelsea faithful. Gianfranco is a fine player and man. A man in posession of a natural, genuine humility. Uncomplicated, small in physique but "giant in vision", he was always destined to be Chelsea’s greatest ever player. His control, change of pace, change of direction and ability of doing the totally unexpected more than once left us short of breath. What more can you say about the man? His iconic, god-like status, ensured he received an incredible 60% of the vote, with 9,805 votes from a total of just over 15,000 in a poll on the club's official website. The 15,000 entries came up with the following top five. 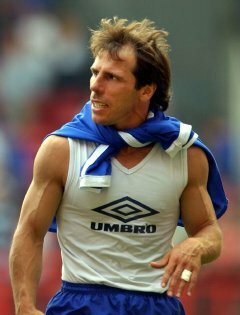 1st Gianfranco Zola, 9,805 votes.